Anyone enjoy smoking this one? It really reminds me of a sweeter version of Dunhill Flake. I am digging the overall flavor profile. I find it to be quite rich. It’s a bit woodsy, spicy on the finish and there’s a decent amount of body to support the sugary sweet aftertaste. I have to admit, the price had me thinking twice, but I am finding it to be worth every penny. Count me in as somebody who enjoys this blend. I enjoy the Blue a lot. The tins I had did contain a fair number of stems that I had to cut up but other than that it's a great blend. It contains"spice residue" in the casing Not exactly sure what spice residue is but I like it. Definately worth the premium price tag. When I tried the Orlik version, it smelled and tasted similar to their Golden Sliced. When I tried the MB version, it was more like a Virginia without an added flavoring. The Imperial Tobacco version was darker and sweeter than the MB one and I never did identify what the topping was. But I think there was one. I love the Capstan Blue Flake and smoke it on a regular basis. All of my tins are from 4/13-6/13 as I loaded up once I knew how much I liked it. It is aging very nicely and has turned much darker than when fresh. I ended up paying 10.90 per tin as I was buying them in lots of 25. I like taking advantage of SP's quantity discount. I too love this blend, one of my go to's. Ya, it's right up there in my top 10 given that I'm a 'ginny guy and love playing around with flakes (no don't take that the wrong way!). Pretty great moisture content right out of the tin. Rub out and smoke. And yes I agree with Chris that it seems a bit sweeter than the Dunnie Flake, a plus in my book. I was lucky enough to snag some tins before the price increase came around a while back so have some aged stock to fall back on. Plus bro AJ sent me some as well. Think I'll pop a tin in the near future as I've been distracted with some other blends lately and have been neglecting this 'un! Interesting to read everyone's opinion here. I have to say that this flake is fast becoming a favorite. I guess I have expensive taste. Anyway, every time I smoke it I notice some little difference in the flavor profile. The very first pipe I owned, an Algerian briar bent billiard that I acquired when I was 18 seems to love Capstan Blue and so far it's been a perfect pairing. I have never been one to dedicate a pipe to a blend but in this case I am seriously considering it. Harris, I take it from your input that this is not a red VA based blend. It's hard for me to tell because my tins are also from 2013 and as you described the flakes have darkened a lot. Does this flake start out life as a golden VA? It surely has that sweetness but the body of Capstan kind of defies the lighter colored VA attributes. A little Danish magic in this one. Anyone have any more info on the mysterious "spice" topping? Man this is a good smoke! I picked it up when it was first re-released because of the legend that it was the tobacco that J.R.R. Tolkien smoked. I ended up loving it and snagged a few tins. I'm glad I did, because now it's pretty expensive. Drums, I am not sure what this blend starts off as but I know it has no reds in it. It darkens like many of my Va flakes. Dunhill Flake, F&T Cut Virginia Plug, Aylesbury Luxury Flake and more. Usually by the ten year mark the color is almost black. I guess I would classify it as a golden virginia? 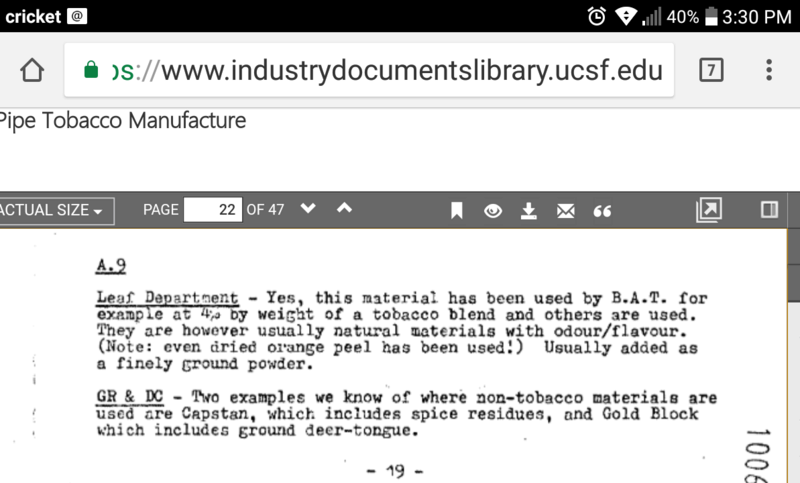 Chris, here is a screen shot of the section of papers released by "big tobacco" that talks about flavoring in Capstan and Gold Block. Interesting! Thanks Jim. Spice residues... Hmmm?? I'm still slogging through a bunch of stuff so they may go into more detail further in. If so I'll let you know. Never smoked Gold Block. I wonder if they still use Deer Tongue. I read that most manufacturers avoid using it because it’s a natural blood thinner. I'm not sure why they've gotten away from using deer tongue. The papers that was from are from the late 60's when it was still in regular use. I’ll join the chorus of those who love this stuff, and thanks to Jim for trying to sniff out just what that extra something about the blend may be! On a side note, a few years back I came across a stockpile of the old sardine can-shaped Capstan tins...but every single one of them had lost its seal. Only ever had one SG style tin lose its seal in all my years but those earlier, narrower rectangular tins obviously didn’t retain their seals very well, so maybe that’s where the bad reputation for non-circular tins came from? Anyway, thehappy ending was I rehydrated the lot and enjoyed the hell out of that reanimated vintage Capstan—I know some folks don’t think much of tobacco necromancy but I really enjoyed the result! Tasted a bit different from the current production, but couldn’t tell ya if that was due to a change in recipe or the fact that it had been aged, dessicated, and then brought back to life.